Does Anyone in Washington Understand the Simpson-Bowles Plan? “Say yes to Simpson-Bowles, Mr. President. I’m willing to say yes to Simpson-Bowles,” Graham said. Graham said Washington needs more revenue, but that the revenue should come from closing tax loopholes and deductions for the rich, not from raising tax rates. “Mr. President, if you will say yes to Simpson-Bowles when it comes to revenue, so will I and so will most Republicans. We can get revenue without destroying jobs,” Graham said. Really? Most Republicans will agree to this? Can we talk? 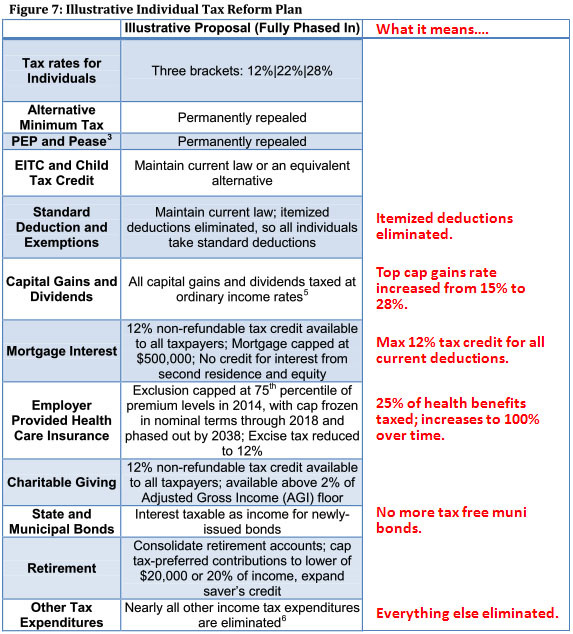 Itemized deductions go away completely, replaced by a tax credit capped at 12% of income. The capital gains rate would increase from 15% to 28%. On average, about a quarter of the value of your health benefits would be subject to tax. This would go up over time. Tax-free municipal and state bonds would be eliminated. Does Graham really think Republicans would agree to this? It’s true that ordinary income tax rates would go down under this proposal, but total taxes paid would go up significantly, especially at the high end. House Republicans refused to support this back when it was first proposed, and I can’t think of any reason they’d support it now. Especially when this $2.6 trillion tax increase would be complemented by only modest additional discretionary spending cuts. What does Graham think he knows that I don’t?